A spiky pitch invader brought a non-league game between Hitchin Town and Arlesey Town to a brief standstill. Monday's Red Insure Cup match was interrupted 60 minutes into the game by a marauding hedgehog, who left a mark on an innocent linesman. "The linesman tried to take it off himself but I think he must have had his hand pricked," Hitchin club secretary Roy Izzard told BBC Sport. "The referee investigated and he more bravely put it over a fence." He added: "We can be well assured that no hedgehogs were harmed in the making of the game. "Someone saw it when most of the players were in the other half. 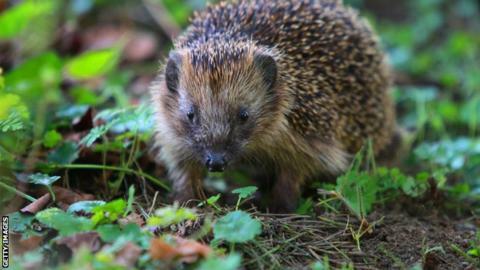 There was this hedgehog. It was near the touchline - it was only a small one." Arlesey won the game 6-5 on penalties against their fellow Southern Premier League side. The story of the intrepid adventurer, photographed by the Comet newspaper, has come at a timely moment for Hitchin, who hope to use the media attention to raise awareness of a campaign to save their ground. Developers want to build a supermarket on Top Field and move the Canaries, residents there since 1865, to a new site on the edge of the Hertfordshire town. "If he can help us to defeat the supermarket it would be amazing," said Izzard. "He can join our committee any time."